I’m sitting in my booth on Saturday at 2:30 in the afternoon. My rear end is flatter than usual and I’m about to crawl out of my skin. Sometimes that’s the life of an antiques show dealer. I had hopes that this might be a decent show, but as of this minute, it doesn’t look likely. If the show ends poorly, we will not return to Los Angeles for our usual two summer shows (that includes the Pasadena Show next weekend). We’ve exhibited at the Los Angeles Antiques Show a couple of times at the Barker Hangar. That was a busier show, so we might return for that one. The problem is that it’s very expensive for an East Coast dealer to exhibit on the West Coast. We have to sell enough to make it worth our while. If it turns out to be a losing proposition, we have no choice but to give up the show. Each year, the results have gotten weaker in Los Angeles, so we’re probably better off doing shows closer to home. I hope to write a different ending to this story, but that’s the situation this minute. Sunday, 7:05 PM PDT. The show is over and I’m reflecting on the results. There were more people today and one good sale. Two total sales for the entire show. That’s pretty awful, but both were good, so it wasn’t a disaster. Also, two separate people came into the show today and sold me some very nice items. Eventually I’ll sell them and earn a profit, so all in all, the show wasn’t terrible, but certainly not good either. I’ll postpone my decision to exhibit at my usual two summer shows in the greater LA area until after this week’s show in Pasadena. If it goes well, we’ll try Southern California one more time. If it doesn’t go well, we’ll stop exhibiting at these two shows. Tune in next Monday for the verdict. I’ll also post a blog this Thursday. 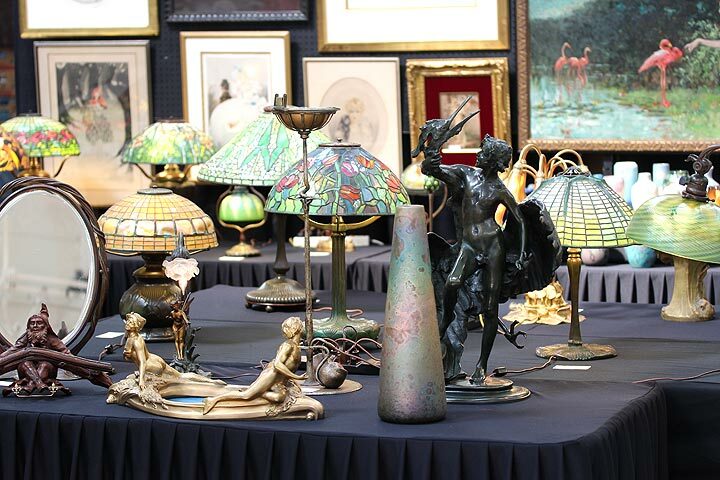 We’ll be exhibiting at the Pasadena Antiques Show this coming weekend, August 3-5. 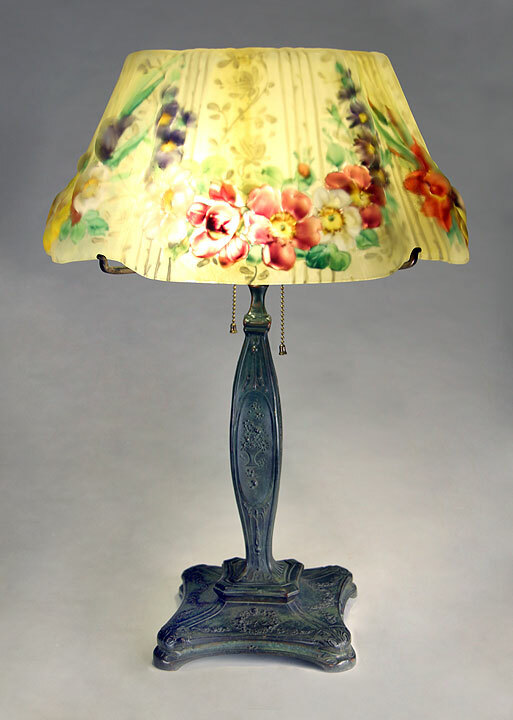 If you missed the Redondo Beach Antiques Show, please try and visit us there. 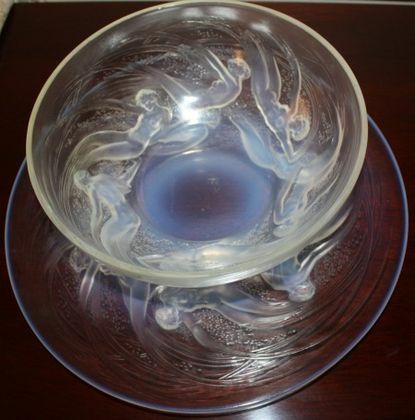 The Redondo Beach Antiques Show will start on Friday, July 27th, at noon, and will end on Sunday, July 29th, at 5 PM. The show has gotten smaller over the last few years, but the dealers who remain are high quality, so it’s still a good show. The problem is that the show needs to enter a virtuous circle, where more people attend and make purchases. The news will get out and more dealers will want to return, making the show better. It’s not an easy task, but unless it happens, the show will get so small that it won’t be viable any more. 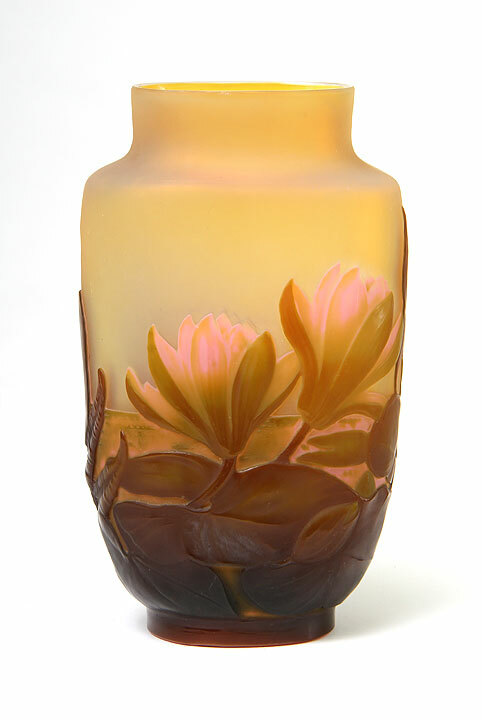 We’re doing our part by exhibiting in the show and bringing an outstanding collection which includes Tiffany Studios lamps, glass and desk sets; French cameo glass by Emile Galle, Daum Nancy, Almeric Walter, Argy-Rousseau and René Lalique; American art glass by Quezal and Steuben; American, French and Hungarian ceramics by Rookwood, Grueby, Newcomb College, Marblehead, Clement Massier and Zsolnay; American illustrator paintings and finally an extensive collection of original Louis Icart etchings. Many people who attend antique shows don’t understand that it’s a business like any other business. If it doesn’t turn a profit, it goes out of business. That includes the antique show business. The promoter organizes the show. He/she needs enough dealers and attendees to make the show a success. The dealers need enough patrons to make purchases. While compliments are much appreciated, they don’t pay the bills. The expenses to transport antiques from the East Coast to the West Coast are considerable. I have to sell enough to make it worth my while. So I am advising my clients in Southern California that this will be the last time I exhibit there if I don’t sell enough to cover my costs and a reasonable profit. I’ve had to drop several cities (Detroit, Cleveland, Indianapolis, Philadelphia, Boston, San Francisco) over the years as the local public stopped supporting their shows by not making purchases. Believe me, the show’s existence depends on your support. Please visit the Redondo Beach Antiques Show and consider making purchases from your favorite dealers. While you’re at it, bring your friends too. My goal is to publish new posts twice a week — Mondays and Thursdays. However, if you don’t see a new post on Thursday, it’s because I was too busy, so please look for a new one the following Monday. This week we’ll go hiking and white water rafting before our shows in the greater LA area, so there won’t be a Thursday post. Heritage Auction held their Illustration Art auctions June 27-28, 2012, proving that Gil Elvgren is still King of the Hill. 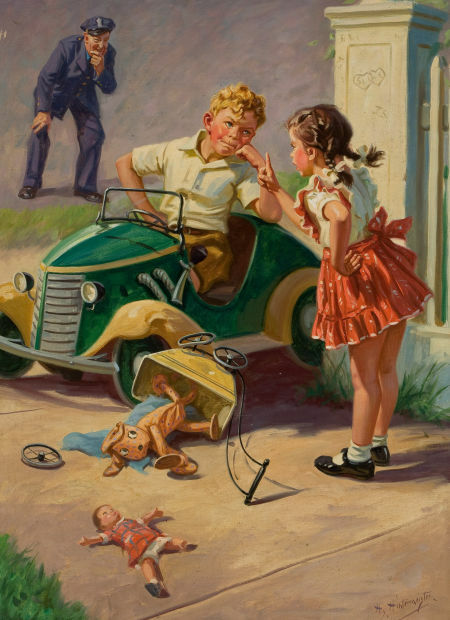 Heritage sold seven works by Elvgren that ranged in price from $11,875 to $176,500, for an average of $82,036, far surpassing the results for any other artist in the sale. Of course there are other illustration artists that can sell for more, like Norman Rockwell, but they weren’t represented in the sale. Besides, Elvgren is noted for pinup art, whereas the other big shots are not. Lot #78139 was an Elvgren painting titled Skirting the Issue (Breezing Up), from 1956. 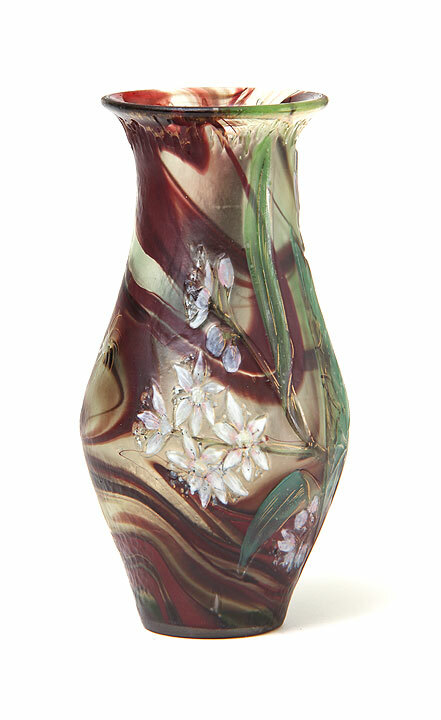 It took the prize for top lot, selling for $176,500, against a pre-sale estimate of $30,000 – $50,000. After Elvgren, second prize, (really 7th prize after six Elvgrens) went to Al Buell. His painting, Brunette Pin-Up, circa 1940, sold for $32,500, against a pre-sale estimate of $1,000 – $2,000 — truly an impressive result. The most a Buell painting has sold for in recent Heritage auctions was $10,000 in March of 2012, so this was quite a jump. Let’s see over the next few auctions if a new level has been set for Buell, or this result was just a fluke. One of my favorite artists, Hy Hintermeister, sold very reasonably. Lot #78314, The Last Word, sold for $4,062.50, against a pre-sale estimate of $3,000 – $5,000. A similar painting, Hold Everything, sold for $20,000 in Heritage’s March, 2012 Illustration Art auction. For the complete results of the sale, click on the following link. Heritage’s Illustration Art results. You’ll have to sign in to view the prices. We’ll be exhibiting at a show at the end of next week in Redondo Beach, CA, July 27-29. Please come and visit us and show support by considering purchasing something. This will be our last time exhibiting in the greater LA area if we don’t sell enough to make it worth our while. 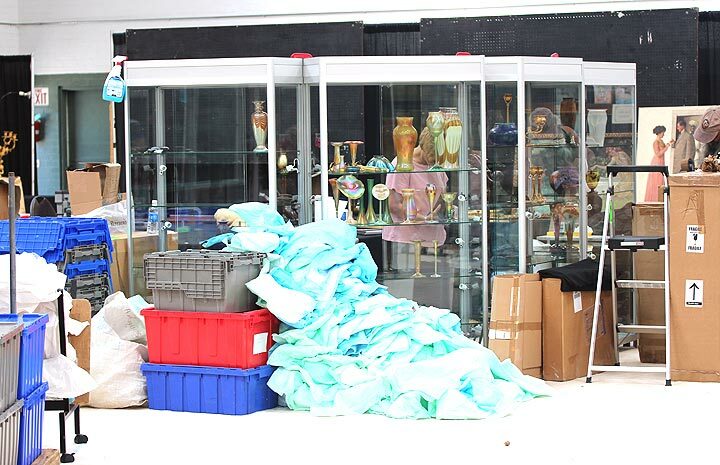 Traditionally, May and June are very quiet months in the antiques business, at least for show exhibitors — there are no shows of any consequence. People get spring fever, so they’re more concerned with making their summer travel plans or planting their gardens than they are with antiques. It’s the perfect time for a little R&R and to replenish our inventory. We look high and low to find good items — we travel, we buy from private homes, we make careful purchases at auction and usually wind up with some great new items for our summer shows. This year is no exception. Here are a few examples. 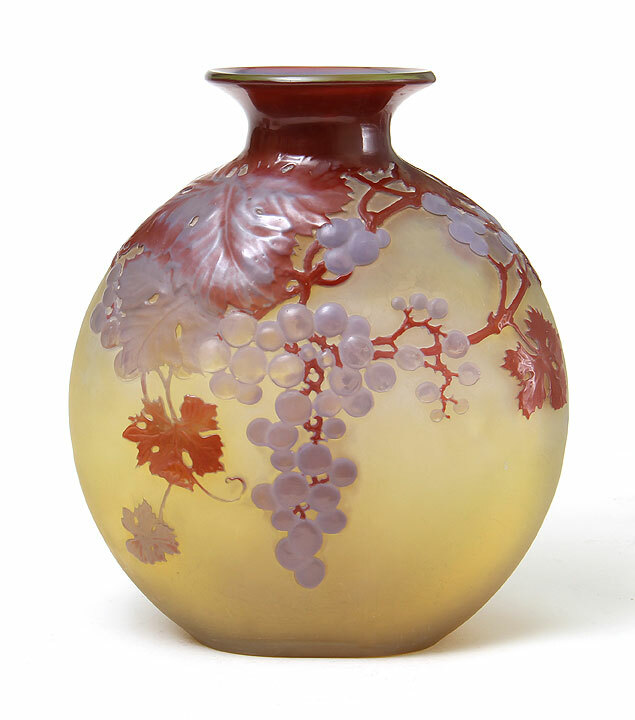 Gallé blownout vases are rarer and more desirable than conventional cameo glass. They’re usually difficult to find, especially with good color. I’ve been lucky, so now I can offer for sale several superior examples, including fuchsia, grapes, and water lilies. 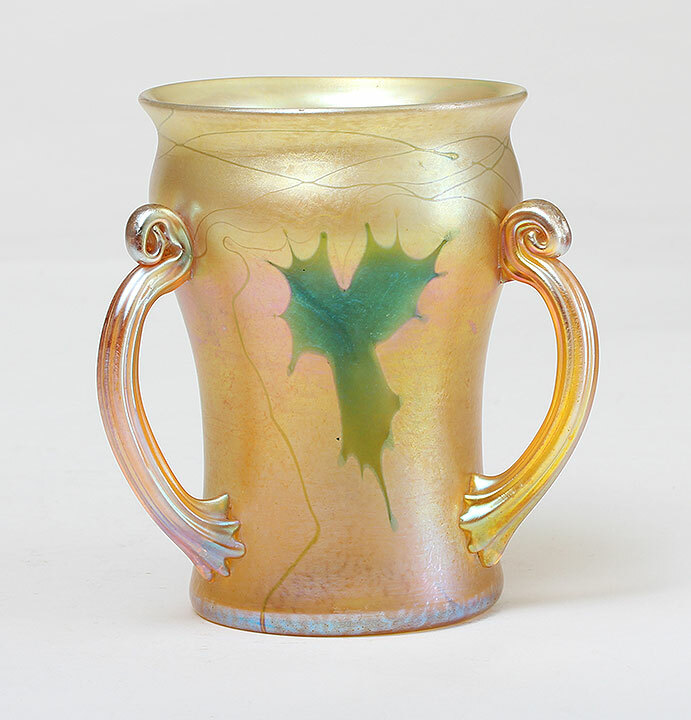 The market in top quality Daum Nancy vases, especially with acid-etching and enameling, has been hot for many years. It doesn’t come better than rain or farm scenics. 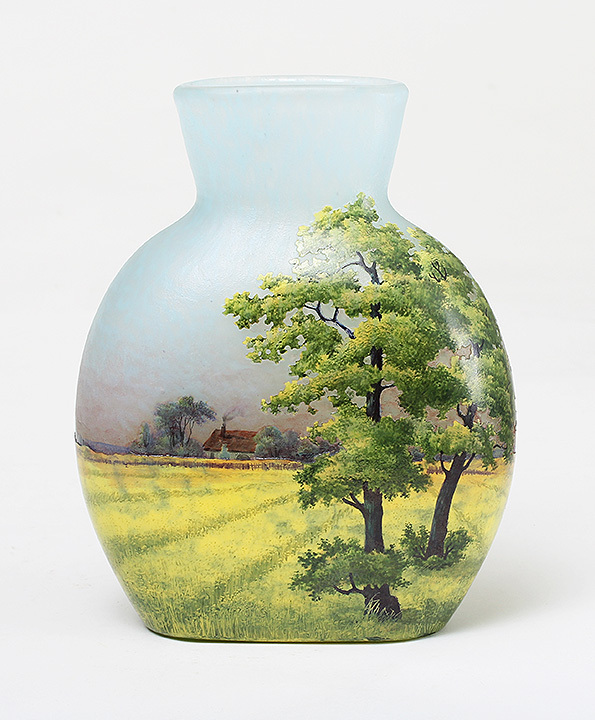 I’ve got a gorgeous rain tumbler and a killer farm scenic vase. The market in better Schneider and Le Verre Français glass is picking up, after having been very slow for a few years. And rightfully so, because it’s wonderful glass. 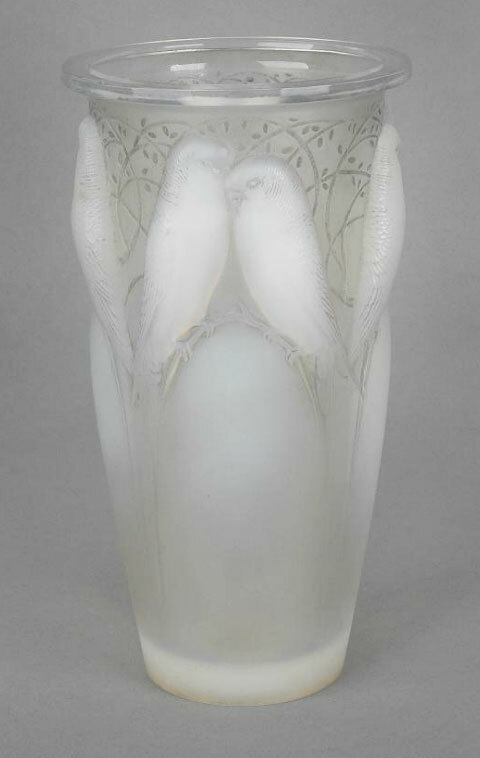 I’ve got some of the top examples, including two killer Schneider vases with padded and wheel-carved decoration. You won’t recognize our booth, we’ve got so many new items, so please take the time to visit us at our two Los Angeles area shows. This may be the last time we exhibit at these shows. It’s very expensive to travel cross-country, so if we can’t sell enough to make it worth our time and expense, we won’t be back. If you want to continue to see antique shows in the greater Los Angeles area, you’ve got to support them. That means visit your favorite dealers and BUY something. Compliments, though much appreciated, do not pay the bills. We’ve stopped exhibiting in several cities where the locals didn’t support the shows, and Los Angeles could be next. 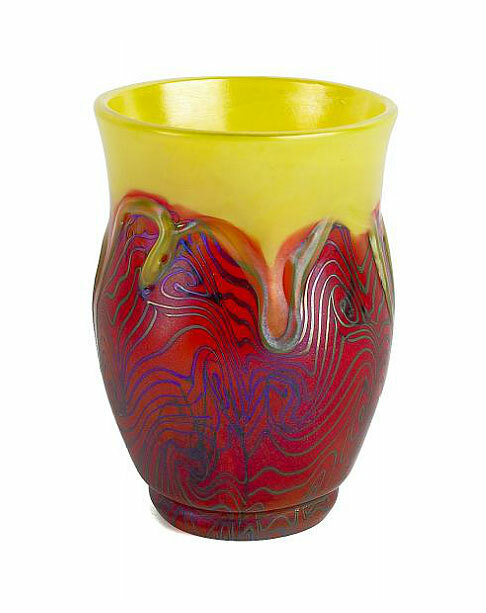 Please visit the Redondo Beach and Pasadena shows and support your favorite dealers. 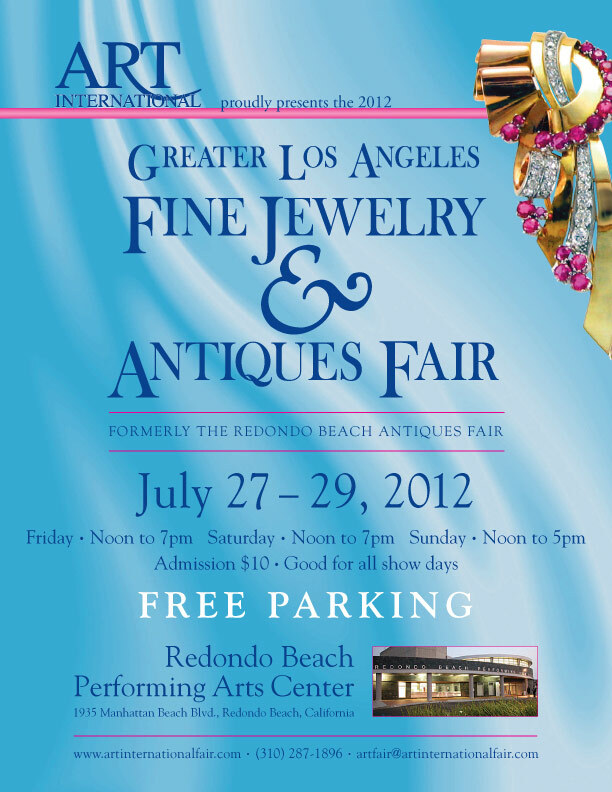 The dates of the Redondo Beach, CA antique show are July 27-29. In the meantime, we’re still very much in business. Don’t hesitate to call or write, and let us know what you’d like to buy, sell, or trade. Have an Apple I computer? It could be worth over $350,000. 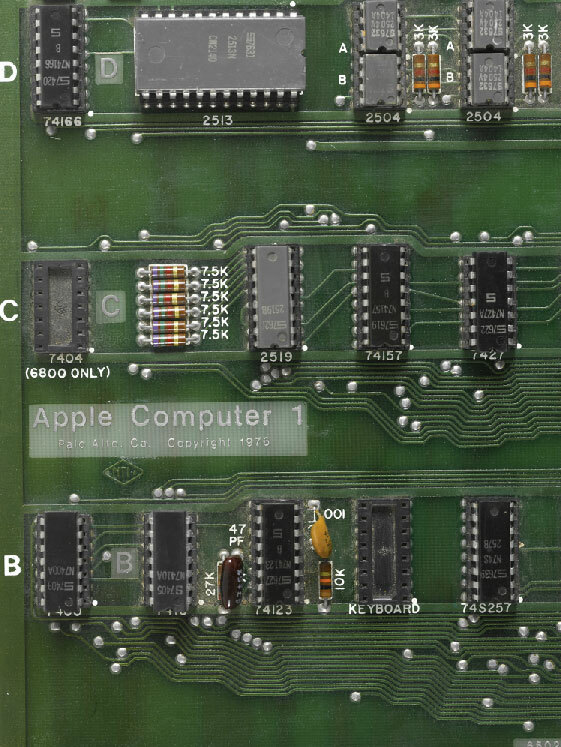 Included in Sotheby’s New York sale of Fine Books and Manuscripts, was a working Apple I computer from 1976, with the original manual. Curious choice of sales in which to put a computer, but apparently they did so because of its historical significance. Estimated to sell for $120,000 – $180,000, it almost tripled its low estimate to sell for $374,500, including buyer’s premium. Not a bad return, considering the original price was $666. It’s also interesting to note that a computer then is not what a computer is today. You only got the motherboard in 1976. You had to supply your own keyboard, monitor and cassette machine to run the programs. Here is the link to Sotheby’s sale. Apple I computer results. 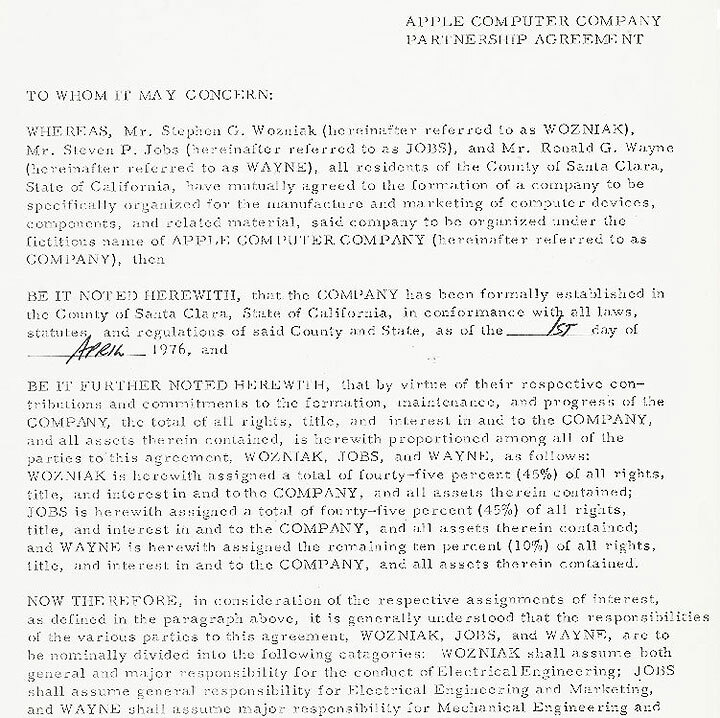 The Apple I sales price shouldn’t have been a surprise considering that in December, 2011, Sotheby’s New York sold three Apple documents, including the original contract for the formation of the Apple Computer Company, for $1,594,500 — 15 times the pre-sale estimate of $100,000 – $150,000. The historical significance of the lot was not lost on the public. Here is the link. Sotheby’s sale of Apple contracts. So go searching in your attic if you were into early Apple computers. Maybe you’ve got a fortune there.